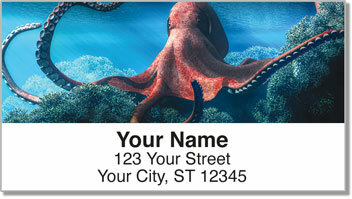 Illustrations of an amazing sea creature make for a set of return address labels that is very unique. What else would you expect from an animal with so many mind-boggling abilities? The eight arms of an octopus are far from the only thing that makes it an interesting study. They are said to be the most intelligent of all invertebrates. They glide through water using jet propulsion and shoot out black ink when escaping danger. Octopi even have not one...but three hearts pumping blue blood through their bodies. 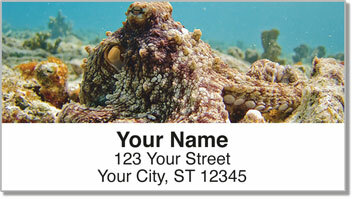 These address labels are a great example of the diverse world we live in. Plus, they'll help you make the tiresome chore of preparing outgoing mail fast and easy. 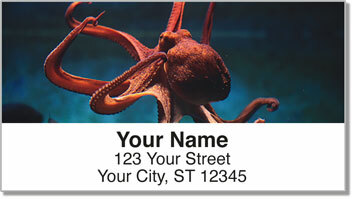 A sticky, self-adhesive backing lets you peel and place an eye-catching design on each envelope. 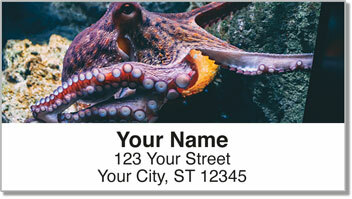 Get your very own Octopus Address Labels today! Complete the order with a set of matching checks.